Cozy Cabin on the Manitowish Waters Chain of Lakes -Includes a boat! Experience the feeling of a traditional Northwoods Resort at Cast Away cabin in Manitowish Waters. Part of the historic Hillcrest Resort, this quaint vacation rental will transport you to another era when fishing and family vacations were a staple of an Up North summer. Located on the Manitowish River, just around the bend from Stone Lake, Cast Away is the ideal landing spot for Northwoods lake lovers who want to explore the Manitowish Chain of 10 Lakes via water. Hop in your rowboat from your private pier and head down the river or put in your fishing boat at the small ramp at the resort to spend the day trying to catch the elusive muskellunge. End your day with dinner on the charcoal grill, a fire in the community campfire pit just a short walk from the cabin, and the sound of the Northwoods lulling you to sleep. Cast Away cabin is well suited for a small family or a couple looking to enjoy a weekend away. 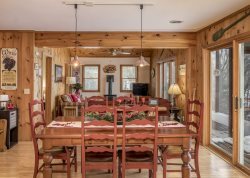 The quaint kitchen and living space is great for a game of cribbage and a romantic meal, and the front porch has just enough space to hold hands and watch the stars. We can’t wait to welcome you to this little piece of Northwoods heaven. 1st floor: 2 bedrooms - 1st BR - Queen Bed 2nd BR - 3 twins (one set of bunks) one sofa sleeper. staff were very helpful before and after our visit. answered our question, and responded to our message when we left. we had notified them that we were leaving early. they called back and confirmed it. the gas stove has a problem. the gas volume stays high no matter how low you want to set the flame on the burner. other than that no problem. One of the pleasant surprises was the traffic on the channel. it was very entertaining to watch the various watercraft cruising slowly by. depending on what friend would want. would give it high recommendation. only negatives are no bathtub , no air conditioning, if that is what they are looking form. Thank you for the review... We will take care of that stove. Easy to work with. Email communication provided excellent directions, explicit explanations, and other necessities. The 4 of really enjoyed the property. Only thing missing on the hottest night of the year was air conditioning (we didnt melt)......but almost. Nice place to stay for reasonable price per night & nice you don't have to rent for full week. Julie was great to rent with. Quick response time, very helpful and friendly.